an al fresco drink before or after some fine dining here is... and we love it because of the amazing vibe it has. Friendly people pack into its cute bar and pavement terrace for great times. This really is one of the Merchant City's main social hubs, for those in the know. And quite right too... Time for you to join them. ... so do you want to know what's keeping those 'in-the-know' folks talking about Citation? It's... that the wait staff working outside don't have to trot back and forth to the bar very much. Operating as a clever team, drinks and change are passed through the window near the bar! Smart thinking, guys! Enjoy! Now... don't tell anyone else. And DO NOT reveal this Citation top secret file and password. We'll know.... And we'll track you down and make you smell my joke squirty flower! And get yourself onto the VIP list below while it's still open, and I'll drop you a short email every time we reveal something new about Citation. Lucky you for being in the right place at the right time! And remember you can grab your own page here to share your tips, photos and stories about Citation. Have fun! Great news! 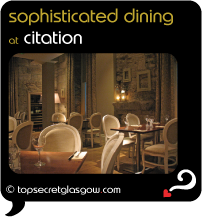 Finding this page means you can now join our VIP list for Citation. You found the Top Secret File for Citation. If you don't have a password yet, there are still lots of great things about Citation in its Buzz Page. ("The Buzz" page is also the place to pick-up the password by taking part).